I love the materials in the sensorial area of the Montessori classroom – they speak to the tactile learner in all of us. What impresses me most about how humans learn is how often we use more than one sense to explore. My mom got some new pillows for her couch the other day, and when she showed them to me, the first thing I did was reach out and touch them – without even thinking about it. The fabric looked velvety, but I had to confirm it with my fingertips. While we commonly think of the five senses (hearing, touching, seeing, smelling, and tasting), Maria Montessori felt that there were more. They include the baric sense (sensing weight), chromic sense (sensing color), thermic (sensing temperature), and stereognostic (sense of movement). What I love most about the sensorial materials is that they are not purely for the enrichment of the senses (though that is a worthy goal), but they are for the refinement of the senses. A child might easily distinguish between “light” and “heavy” based on real world experiences. However, they need additional exploration to distinguish between “light” and “very light”. This discrimination is brought about by experience with materials that are graded, that is, they have only slight variances between them. An example would be the Rough and Smooth Boards. They have sandpaper on them that slowly moves from smooth to rough, with several stages in between. It’s hard to duplicate this kind of controlled exploration with real world experiences, but once the child has used the sensorial materials, they can more easily discern shades of color, weight, texture, and temperature in real life. When you look over the sensorial area of the Montessori classroom, you will find materials that address each of these areas. The Thermic Bottles help the child to distinguish small variances in temperature. The Color Tablets help refine and strengthen the chromic sense. Some may argue that the “extra” senses of Montessori are just subcategories of the main five. That is probably true, but I think it’s helpful to break them down in order to see the development of each quality in each child. 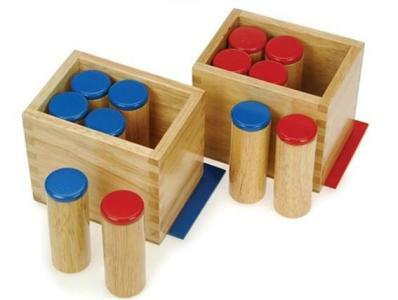 The Cylinder Blocks are wooden blocks that contain 10 cylinders of various sizes that can be removed by a knob. These are designed to help children learn to distinguish between large and small, tall and short, and thick and thin. Children use the blocks mainly by removing the cylinders from the blocks and replacing them appropriately. The Pink Tower includes 10 pink cubes measuring from 1 cubic centimeter to 10 cubic centimeters, at increasing intervals. This material can be used as a stacking exercise by stacking increasingly smaller blocks one on top of another, reinforcing the concept of large and small. 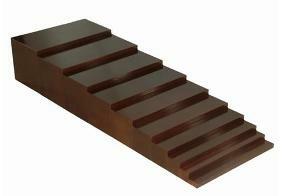 The Brown Stair (or Broad Stair) teaches thick and thin by allowing children to visualize the concept by placing increasingly thinner prisms in succession to create a downward staircase. In addition, the pink tower can be used with these stairs to allow children to discover and create their own designs. The Red Rods include 10 rods, equal in diameter but variant in length. They represent a very tangible way for children to experience long and short. The Colored Cylinders are much like the cylinder blocks, but without knobs, and occurring in four colors and variations. The yellow cylinders vary in height and width (from short and thin to tall and thick). The red cylinders vary only in width, while the blue cylinders vary only in height. The green cylinders are the converse of the yellow ones, with short and thick progressing to tall and thin. When yellow, red and green cylinders are placed on top of each other by diameter, they are all be the same height. There are limitless possibilities for work with the colored cylinders, from tower stacking to matching, to arranging patterns. The Binomial Cube contains one red cube, 3 black and red prisms, 3 black and blue prisms, and one blue cube. The pieces are stored in a box with the color pattern painted on it, with two opening sides. It represents the mathematical equation (a+b)3 for elementary education, but serves as a sensorial material at the primary level. The Trinomial Cube is similar to the binomial cube, but has slightly different pieces: one red cube, 6 black and red prisms, one blue cube and 6 black and blue prisms, one yellow cube and 6 black and yellow prisms. It represents the mathematical equation (a+b+c) 3. The Monomial Cube is similar to both the binomial and trinomial cubes, but simplifies the equation by allowing children to multiply by the power of 2. The Geometric Cabinet includes various shapes that are inset like wooden puzzles. This can be used to distinguish shapes, learn their names, and tell their qualities apart. The Geometric Solids are 10 blue 3-dimensional shapes including sphere, cone, ovid, ellipsoid, triangle based pyramid, square based pyramid, cube, cylinder, rectangular prism, and triangular prism. The Constructive Triangles are a set of wooden triangles that can be combined to form various shapes such as a parallelogram, hexagon, rhombus, and trapezoid. The Mystery Bag contains items of differing shapes and textures. The child reaches into the bag, isolates an object, and decides how to sort it. Then he or she removes the item and checks his or her conclusions visually. Rough and Smooth Boards have various grains of sandpaper glued to them, helping children discriminate between textures. The Fabric Box is a box of fabric with different materials that a child can feel and match according to texture. This activity is often done blindfolded. Thermic Bottles are metal bottles to which different water temperatures are added. Children learn to distinguish between hot and cold and can order them from hottest to coldest. The Sound Cylinders are made up of two boxes, one with a red top and one with a blue top, each containing 6 cylinders. The cylinders contain materials that give off various sounds, and the cylinders with red tops can be matched to those that have blue tops by sound. The Bells include a set of 26 bells of different frequencies, allowing children to develop a strong sense of musical tones. There’s a version of the Montessori Bells online if you don’t have access to this (somewhat expensive) material. Thanks to Alison’s Montessori for the pictures in this post.